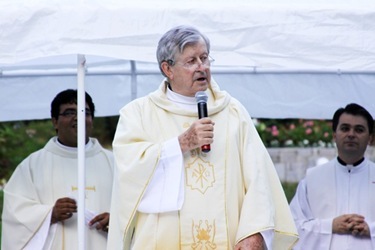 Last Friday, I was the main celebrant at the funeral of Father Jim Field, the pastor of Incarnation Parish in Melrose, who had been battling cancer for many months. 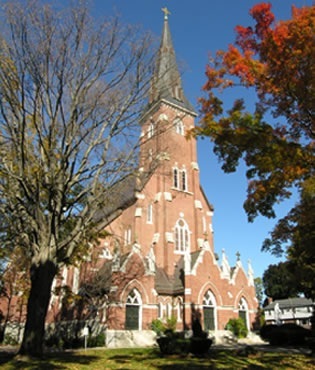 Many parishioners were able to come to the Mass at his parish church. It was a Friday morning, but the church was packed. 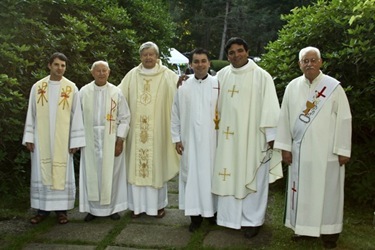 Many priests accompanied me. He was a great example of courage and faith as he prepared for death. 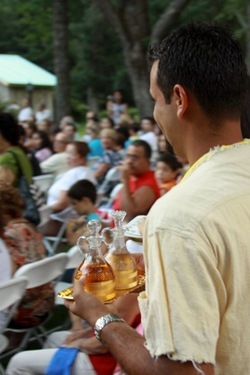 I gave him the sacraments when I visited him in the hospital a few weeks ago. We had a wonderful visit. We were able to pray and talk together. His parishioners were very, very supportive of him throughout his long illness. He will be sorely missed, but fondly remembered. 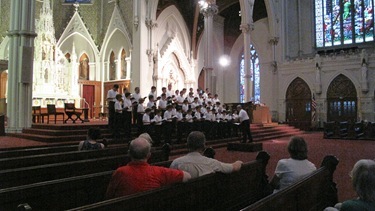 Friday evening, there was a concert by the Paris Boys Choir at the Cathedral. They were from Neuilly-sur-Seine in Paris. They call them Les Petits Chanteurs de Sainte-Croix de Neuilly. The concert was stunning. 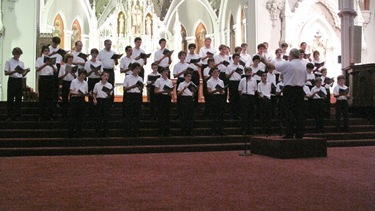 The choir, I think there were about 50 or 60 boys, performed beautiful polyphonic music in Latin and French. They sang music by composers such as Palestrina, Victoria, Bach, Mozart, and French composers Fauré, Poulenc, Duruflé and Franck. 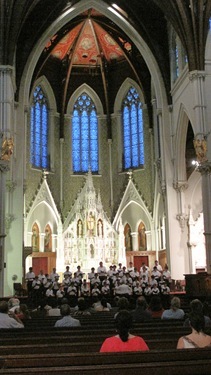 While here in the United States, they performed at St. Paul’s in Cambridge, as well as New York and Washington. On Saturday, I officiated at the wedding Mass of Peter Lynch’s youngest daughter at Our Lady Star of the Sea Parish in Marblehead. Peter Lynch’s daughter Elizabeth married a French count, Gonzague de Montrichard, a very fine Catholic gentleman. Peter Lynch, a Fidelity executive, has been involved in the Catholic Schools Foundation and is a promoter of Catholic philanthropy. The wedding was very beautifully executed. 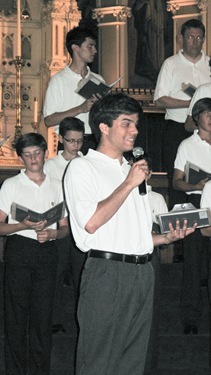 The boys from our choir school at St. Paul’s in Cambridge sang. The reception was at the Lynch’s home. The dinner was preceded by spectacular fireworks — they could have been in Washington, D.C. at the mall for the Fourth of July! There was 40 minutes of music in the background, and the fireworks show was over the water. It was quite amazing. I didn’t stay for the dinner, which started quite late — about 10:00p.m. I was very happy to meet many of the groom’s family. About 60 of his family came from France. Peter and Carolyn Lynch were radiantly happy with the wedding, which was good to see. They do so much to help so many people. I was at Our Lady Help of Christians in Newton on Sunday for their annual Italian feast in honor of Our Lady of Mount Carmel. 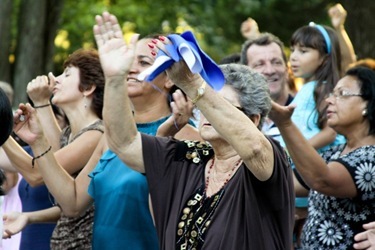 They celebrated it on the Sunday after the actual feast, which is on July 16. I celebrated the 8 a.m. Mass in Italian and the church was packed. Msgr. Deeley had just preached a triduum in Italian, three days of Masses. 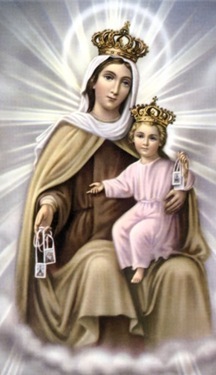 Unfortunately, I was not able to stay the whole day, but I understand that there was a procession with the statue of Our Lady in the afternoon. 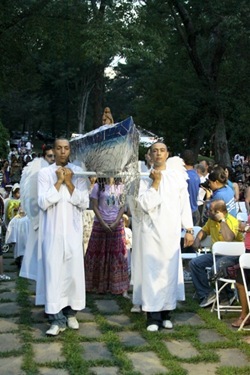 They even have an angel on a cord that comes zipping across the sky as part of the procession! 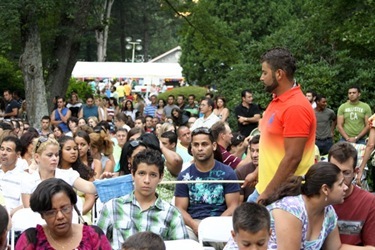 That afternoon, I participated in the 36th Annual Benefit for the City of St. Jude at a celebration in Malden. As it does each year, the event drew hundreds of people and raised thousands of dollars for the charitable ministry and works of mercy of the City of St. Jude in Montgomery, Alabama. 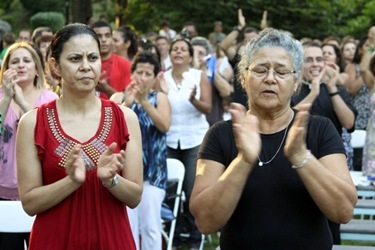 This year’s celebration was bittersweet because the local founder of the benefit, Malden Police Commissioner Anthony Spadafora, passed away in May. It was wonderful to have the opportunity to gather with local clergy at the event from Jewish, Muslim and other Christian faiths. 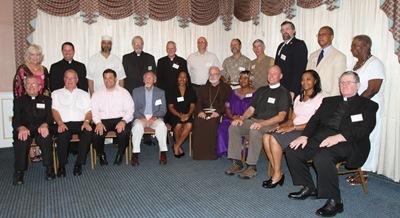 That night, I had dinner with Archbishop Hughes, Msgr. 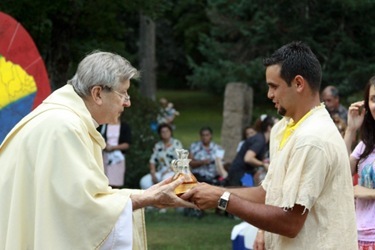 Francis Kelly, and Msgr. Cornelius McRae at the small cottage that Msgr. McRae has in Marshfield. Archbishop Hughes, who is originally from Boston, was back home on vacation. The archbishop and Msgr. McRae had been out sailing that afternoon, and they invited Msgr. Kelly and me to join them for dinner and conversation. It was wonderful to catch up. Archbishop Hughes showed us a book they had just published about the Church’s response to Hurricane Katrina. 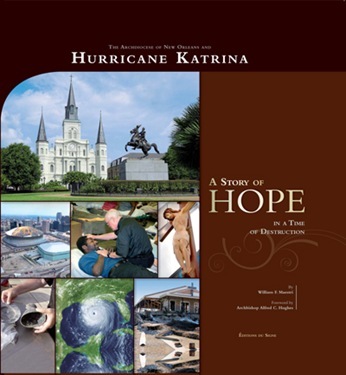 It is called “The Archdiocese of New Orleans and Hurricane Katrina: A Story of Hope in a Time of Destruction,” and is soon to be released. 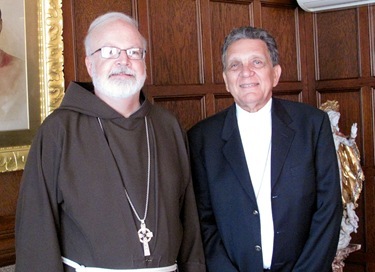 Bishop Charles Dufour of Montego Bay was here Tuesday for a visit. I knew him from the days when I was bishop in the Virgin Islands. I had been the Apostolic Visitator for the seminary in Kingston, where he was the rector at the time. 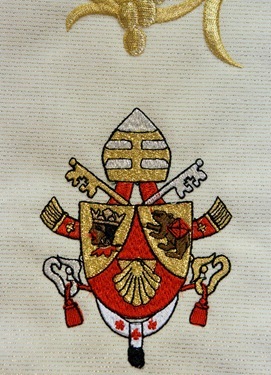 Bishop Dufour is now the Bishop of Montego Bay, which territorially is the largest of the three dioceses on the island of Jamaica. The archdiocese, of course, is Kingston, and Mandeville is the newest diocese, and then there is Montego Bay. It’s a very poor missionary diocese with a small number of Catholics. The bishop is an extraordinary individual. 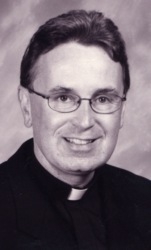 He is a priest of the Archdiocese of Kingston. He knows many of the Jesuits who have been missionaries in Jamaica, and was here visiting some of them. On Wednesday, for the second time since being named archbishop, I was called for jury duty. I reported with my fellow prospective jurors and we first listened to a presentation given by one of the judges to prepare us for jury, and then there was a video presentation. I was not chosen to sit on a jury. I guess they didn’t need me! In Massachusetts there is a system where people are called to serve on a jury for one day or for one trial. Of course, that means there is a fairly heavy turnover and people are called frequently. I haven’t been selected to sit on a jury either time I have been called, which is too bad. I was looking forward to serving. Jury duty is an important civic responsibility, in order that citizens have the opportunity to have their cases heard by fair minded peers. We should remember that if it was our case being heard, we would want good people on the jury, and so we should respond to this important call to service as it is asked of us. 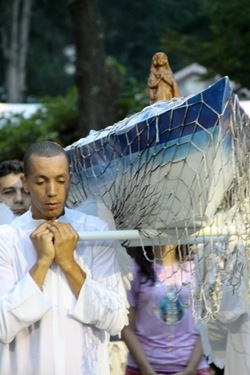 The patronal feast for the Brazilians is the feast of Nossa Senhor Aparecida (Our Lady Who Appeared), which is on October 8. 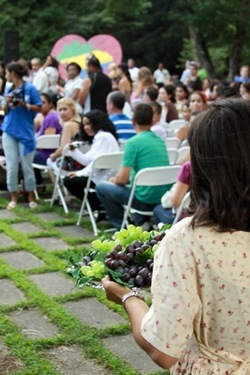 They always have a Mass in the middle of the summer because it is easier to gather people. 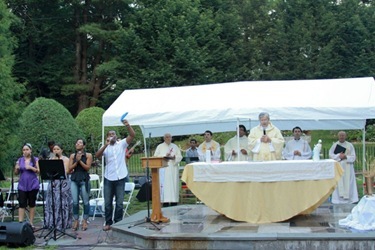 They have an outdoor Mass at the Fatima Shrine in Holliston. I have joined them in the past, but was unable to attend this year but I asked them to send some photos to share with you. 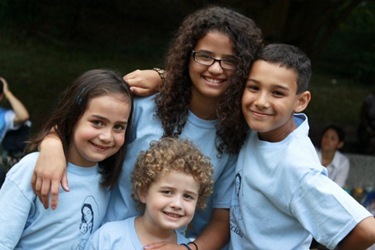 It’s always an extraordinary event with many, many young families. Finally, last month the Holy Father celebrated the closing of the Year for Priests at the Vatican. 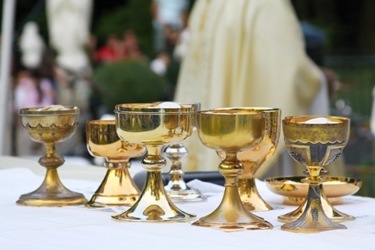 I hear it was a wonderful celebration with thousands of priests and bishops in attendance. Unfortunately my obligations in Boston prevented me from attending the event so I was happily surprised when I received a memento of the celebration in the mail. 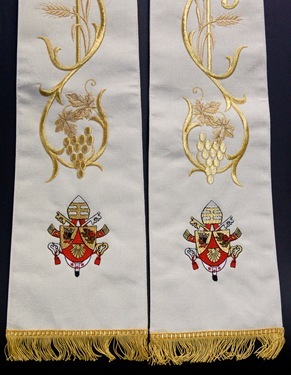 Cardinal Hummes, the Prefect of the Congregation for the Clergy, sent me this stole that was designed for the occasion.